With 35+ hotels currently open in North America, Europe and Asia Pacific, Moxy Hotels boldly reinvents the hotel experience. The brand appeals to the young and the young at heart and encourages its guests to play on. Moxy offers a new way of travelling in which smaller is concentration, not reduction – where affordability is not a sacrifice of style, nor a loss of comfort. Moxy Hotels fully embraces today’s fun-hunting traveller with smartly designed tech-enabled rooms featuring motion sensor lighting; internet TV in-room featuring Netflix, YouTube, Hulu, Pandora and Crackle; selfie photo booth elevators; Moxy Digital Guestbook; abundant power and USB outlets; and Moxy ‘B&F’ (beverage & food) strategy that offers 24/7 self-service to give guests access to what they want, when they want it. Moxy’s design and style are seriously considered and playfully executed. Today’s modern travellers prefer to spend more time in public spaces, to work and play. So Moxy’s living rooms become the centre of activity in all of the brand’s hotels around the globe, giving guests exciting ways to work hard and prioritize play. From the communal NOW public space to smart, flexible bedrooms, Moxy is a bold, surprising design for the socially extroverted, energetic consumer. The style features an industrial chic look and aesthetic of polished concrete floors, exposed concrete columns, and open ceilings. 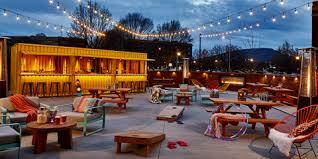 Moxy Chattanooga Downtown, developed by 3H Group, is centrally located in Chattanooga’s exciting Southside. The four-story, 108-room hotel was thoughtfully designed by Celano Design Studio to highlight the eclectic mix of art, entertainment and people from the Southside neighbourhood. Moxy embraces the Southside’s growing energy and pep in a way that enables free-spirited travellers to have everything they want and nothing they don’t. Live music, nightclubs, Southside restaurants, and laugh out loud comedy is just a taste of what guests will experience while staying in Chattanooga’s most up and coming neighbourhood. Moxy Atlanta Midtown is slated to debut in January 2019 in one of America’s most dynamic business districts and a regional epicentre for music and arts. The 155-room property, developed by Noble Investment Group, was designed by Baskervill for the guest rooms and Streetsense for public spaces. Located on an entire city block between 13th and 14th Streets, the LEED-certified hotel is central to Midtown’s commerce hub, Georgia Tech University and in the heart of the arts – minutes from The Woodruff Arts Center (High Museum, Alliance Theatre, Symphony Hall), Museum of Design Atlanta, The Fox Theatre and Savannah College of Art & Design. The hotel features eclectic local artwork sourced by Soho Myriad Art Consulting, including “Welcome Home,” a 54-foot mural by renowned Atlanta artist, GREG MIKE. The hotel also features a rooftop-level pool, cabanas, meeting space and state-of-the-art workout facility. High Note, a vibrant rooftop bar, invites locals and visitors alike to enjoy Atlanta’s southern hospitality with a comfort-inspired menu and hand-crafted cocktails. Moxy Atlanta Midtown is dual branded with AC Hotel Atlanta Midtown, which is also slated to debut in January 2019. Moxy Memphis Downtown is located at Court Square and on the trolley line, blocks away from the Beale Street Entertainment District, the South Main Arts District and the Mississippi Riverfront. The property is scheduled to be unveiled in Spring 2019. Designed by Manuel Zeitlin Architects and Bounds and Gillespie Architects, the hotel includes 118 guest rooms. The hotel’s exterior will feature a modern front porch theme, fitting nicely with the lively park atmosphere adjacent to Court Square. Moxy Nashville Downtown plans to welcome guests with its style, design and attitude. Situated on Nashville’s storied Lower Broadway, the hotel is expected to debut in May 2019. Designed by Celano Design Studio, the hotel’s public spaces will be inspired by the country rock music style of Nashville. Moxy Louisville, slated to open in November 2019, is situated in the historic and revitalized Whiskey Row neighbourhood of downtown Louisville and steps away from the KFC Yum! Center. The 110-room hotel, developed by White Lodging, Poe Companies and REI Real Estate Services, is designed by HKS, Inc. and FlickMars. Opening in the city known for its famous horse races, foodie mentality and southern charm, Moxy Louisville will welcome guests with locally inspired contemporary design, industrial chic style and a playful social scene. The social scene caters to guests and locals alike and will include Bitter’s End, a rooftop bar serving whiskey-inspired small plates, original drinks, and plenty of good old-fashioned bourbon; Zombie Taco, a 24-7 food truck inspired concept complete with a walk-up takeout window; and Bar Moxy, featuring a curated music program with activations including spinning DJs and a podcast booth. Moxy Louisville is dual branded with Hotel Distil, a Marriott Autograph Collection Hotel, which also is targeted to open in November 2019. -- -- -- .